This Spinach & Artichoke Flatbread made with baby spinach, artichoke hearts and a lemony, cheese sauce is perfect for pizza night or game day snacking. With the next several weekends being glued to the TV between the Super Bowl and the Winter Olympics, I wanted to create another flatbread recipe since my family really enjoyed the Copycat Olive Garden Caprese Flatbread I made over the summer. It’s kind of a Sunday ritual in our house anyway to make a few appetizers and stay home on a Sunday. It’s our “family connection day” and we try not to make plans outside of the home. We generally either entertain family or just relax and watch movies while unwinding from the previous week. 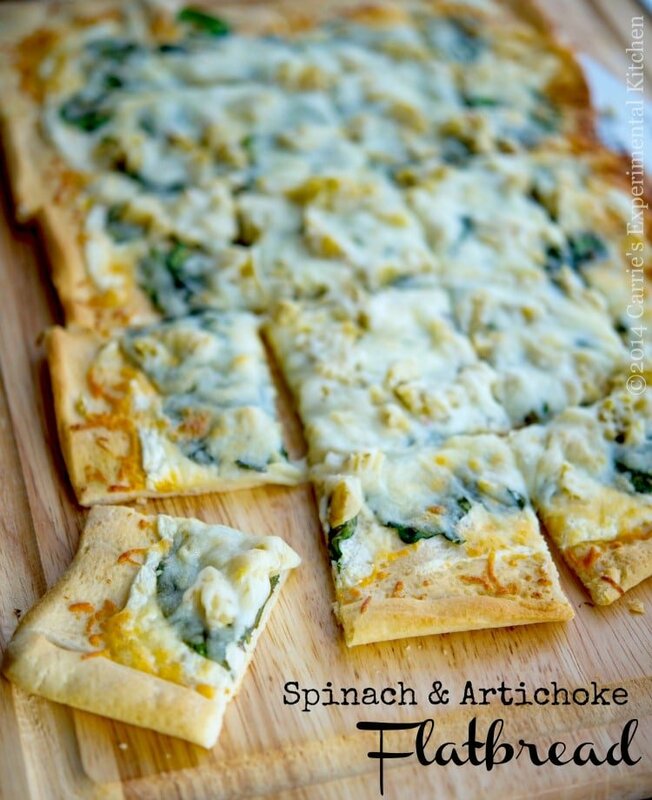 I decided to make a new experiment and created this Spinach & Artichoke Flatbread; which has a little lemony twist. 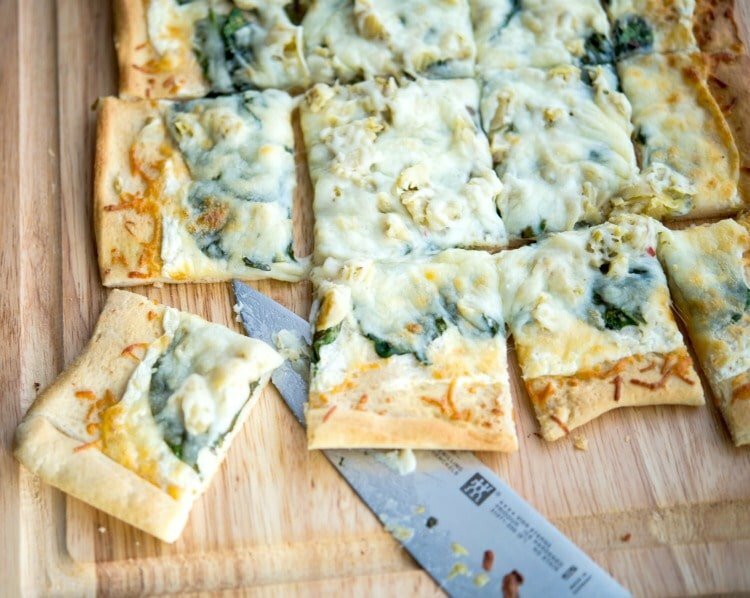 This Spinach & Artichoke Flatbread made with fresh baby spinach, marinated artichokes and a lemony alfredo sauce was INCREDIBLE! It makes 20 pieces, but it was very difficult to eat just one piece of this. The tangy lemon sauce combined with the tart flavor of the marinated artichokes really gave this flatbread a nice flavor. The family really liked this version and said I could definitely make this one again. ~Enjoy! Drizzle 1 tbsp. olive oil on a baking sheet (mine was 11"x17"), spread the oil around the pan and flatten the pizza dough, making sure it reaches the edges. Bake for 5-7 minutes. Remove the dough from the oven and allow to cool. Then preheat the oven to 425 degrees. While the dough is in the oven, melt the butter in a small saucepan over low heat; then whisk in the flour forming a roux. Whisk in the half and half, cheese and lemon zest and stir until the sauce has thickened; approximately 2-3 minutes. 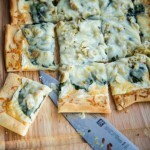 Spread the sauce on top of the cooked dough, then spread your spinach leaves and chopped artichokes on top of the sauce. Top with the mozzarella cheese, place the bread back in the oven and bake for an additional 5-7 minutes until golden and bubbly. Cut into fourths lengthwise, then into fifths horizontally giving you twenty squares. This looks amazing and perfect for the Superbowl! What a terrific sauce combo. I picked up a container of blended cheese yesterday and I think you’ve inspired me to incorporate that on a pizza. Pinning to my Friday Night Pizza Night board so I can find this again. Thanks Kirsten, the sauce combined with the marinated artichokes really gave it a nice flavor. ~Enjoy! I love anything spinach artichoke, this was so good! Loved the sauce! May add garlic next time, great recipe! 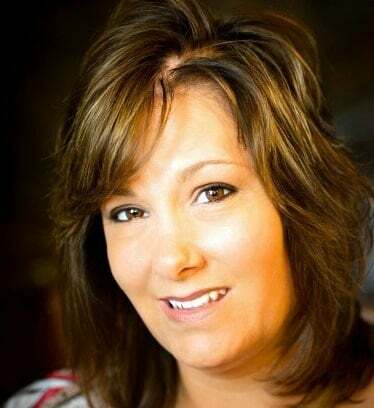 I’m so glad you enjoyed it Crissy!